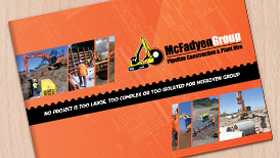 McFadyen Group - Look no further than McFadyen Group for all your heavy equipment needs. We offer reliable pipeline construction and plant hire in the Gold Coast. McFadyen Group understands the need for sustainable business operations. We provide all the heavy equipment for your construction site. We have a range of equipment for hire available in different areas in Australia. Our experienced staff will guide you every step of the way to make sure you’re on the right track. We’ll help you manage your resources and maximise efficiency by providing affordable machinery and plant hire in Gold Coast. McFadyen provides skilled operators for all the earth moving equipment we rent out. We also offer support services for both dry and wet hire machinery. Our strong reputation is evident in the growing number of clients who entrust their projects to us. Our team members will coordinate with you regarding your construction and equipment needs. They’ll discuss all applicable rates and charges, along with the strategies you can use to maximise your site’s efficiency. We work with the right people who know the industry, so you can be sure you’re getting the best services possible. We also ensure that the equipment we offer comply with safety and state regulations. Contact us and let’s talk about your business needs.